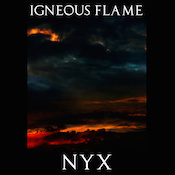 Taking advantage of the freedom from time constraints offered by downloadable music, Igneous Flame (aka Pete Kelly) provides two solid hours of brain-gelling ambient on Nyx. Right from the start this is big, densely layered work, a confluence of cloudy structures fringed in places with strong hints of darkness. Nyx exists, more or less, right at the edge of evening, a place where the light is certainly not its lightest but true darkness has yet to arrive. We’re headed that way, but never quite cross over in one direction or the other. This leaves us in a richly described world-in-between with two hours to carefully look around with our mind’s eye–and there is plenty to take in. The gentle dynamics of the compositions make good use of slow rises and equally slow falls, with the rises often swelling to a dramatic intensity. Here’s where you pause to take in the richness of it, the way it fills your head, the number of sounds coming together before they drift back apart. I particularly like this feel in “Zephyr,” and how Kelly infuses his thinner moments with a hiss of ethereal wind. Igneous Flame albums have always leaned toward warm tones, even when there’s a bit of nascent unease to the music, and that’s very much the case here. Choral pads moan across the sounds in “Night on Earth” like the chant of some forgotten religion. Electronic winds sigh and minor chords in low registers render a sinister edge. And yet, still, the softness of it all gives it a calming edge, or at least a touch of distance from concern. “Mysterium” opens with a mix of low drones and quiet clattering, then resolves into a mix of long, hushed pads. This is another near-dark excursion, with a title-appropriate hint of the sacred lurking at the edges. Just short of the four-minute mark, the textures ramp up briefly, just edgier enough than the rest of the sounds to really catch your ear. (Trust me: by this point in Nyx, you’ll be operating on a semi-subconscious level at best; your brain will be fully immersed.) “Gold Lion” feels like the brighter side of “Mysterium.” The choral voices again come in, but they ride on pads that bend upward. The piece is layered on top of higher-end sounds and chords that give it a shimmer and an aura of optimism. Kelly notes that in mixing down the album, he cut out a lot of the high frequencies, aiming to give Nyx a “softer” sound. Even prior to knowing this, I felt like there was a somewhat diffused edge to the sound, the borders encircled in a hint of fog. There are certainly no rough edges to be heard. Everything flows, and it flows with grace and ease. I have existed within the wide boundaries for Nyx for hours. I have worked with it playing on loop in my headphones, and no matter where I came back to it, the sound immediately took me back in. I have slept as it looped, its gentle tones quite…hypnagogic. I have given it deep listens, and I have let it fill a space at low volume. It is yet another masterful work from Igneous Flame. It also marks something of a waypoint in the Igneous story; Kelly’s most recent work is taking him in a new “more (for want of a better word) ‘musical’ and structured” direction. He’s always been an artist interested in refinement and redefinition of his identity, so I’m looking forward to that. In the meantime, if Nyx marks the end of a chapter in this musician’s story, it is a very perfect ending.